Music enthusiasts and audiophiles understand the importance of listening to good music with good equipment. Most people like listening to music at school, home, college or on their way to work. However, sometimes, the real pleasure of listening to music is interfered by the noise from streets, hooting cars and majorly, bad sound quality headphones. In such cases, having even the simplest amp can help improve the sound quality. Headphone amps are audio amplifiers that specifically drive headphones in place of loudspeakers. They are often embedded in electronic devices such as portable music players, standalone units and televisions (Source). With the vast availability, finding the best headphone amp under $100 can be challenging. Even the best and expensive unit can have shortcomings such as loose bass, sibilant highs and lack of details. However, worry not as our guide below will help you make the right choice. 7.1 Do you need it? 7.2 Where Do You Intend to Use the Amp? 7.3 How Much Do You Want to Spend? The FiiO A3 Portable Headphone Amp is a compact headphone amplifier with a lot of features for audiophiles to enjoy. The device comes with an all-metal body and slightly sloping front and back-sides, resembling a mini-flask. This resemblance increases if you look at the volume knob, which is similar to the neck with a screw cap. This modern design is complemented by the high-quality production, perhaps the reason why the amp works with nearly all the gadgets. With only 96grms, carrying the amp around wouldn’t be an issue. Ergonomics and ease of use is something crucial for any electronic device. 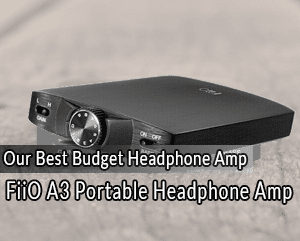 Nonetheless, worry not as the FiiO A3 Portable Headphone Amp’s quality of sound is good. It eliminates nearly all the external noise, giving you ample time to enjoy your music. The FiiO A3 Portable Headphone Amp can be a great addition to simple players. It works great with the FiiO X1 and all other smartphones. It produces enough power, backed by the lithium-ion battery, for most existing headphones, including on-ear models. The amp comes with a mini-jack that develops output power of up to 450mW. The headphone’s impedance 16 ohms when working with 32ohm models makes it compatible with most headphones models available on the market. For accurate matching of low and high impedance, the FiiO A3 Portable Headphone Amp has a gain switch with a special scheme for bass enhancing. With such activation, you will enjoy accurate and energetic low-frequency sounds, which are good for most genres of music. The Creative Sound Blaster E3 Headphone Amp is a truly multifunctional sound device. To begin, it can be used as an external sound card when connected to a personal laptop or computer. Similarly, it can be used as a Bluetooth AMP. 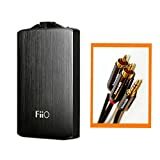 With this, any speaker lacking Bluetooth capabilities connected to the E cable can be connected to any reproducing device. Thirdly, the Creative Sound Blaster E3 Headphone Amp supports a wired connection. The impedance value for both wired and wireless connection for this device is the same. 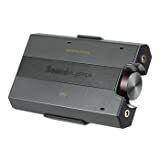 The amp can magnify signals from almost any headphone with high or low resistance value. This makes listening to music or watching movies much more enjoyable. 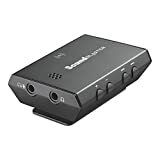 It comes with an on-the-go cable that helps in connecting the Creative Sound Blaster E3 Headphone Amp to a tablet or smartphone. Apple devices are recognized via AirPlay. The reason behind this amp’s quality sound is the ASIO technology. This is a low-latency audio transmission formula that supports sound processing software in real-time. The Creative Sound Blaster E3 Headphone Amp’s built-in lithium-ion battery supports one-hour continuous usage. However, the discharge time depends on its usage. The battery lasts 17 hours when connected through the cable and 8 hours if connected via Bluetooth. The FiiO E11K Headphone Amp outshines other headphone amps by far. It is a perfect headphone amp that brings precision to these devices and softens the edges on crisp sounds. It comes with a switchable built-in 3dB boosting circuit superior to the EQ software that backs up high-frequency recordings, making the sounds livelier without being overly obstructive. The additional bass boost makes it easier to change sound profiles for various audios and tracks of various songs. The amp’s volume potentiometer with barrier-free design makes it easy to operate. The fixed volume full-scale line level output maximizes signal quality. It also has the ability to convert USB digital audio to coaxial digital audio output. The modern OS automatically supports this without requiring drivers. 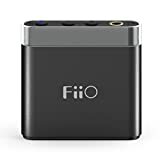 Yet another device from the FiiO, the FiiO A1 Headphone Amp is a good choice for traveling enthusiasts. Previous models of the A series had plastic cases. However, FiiO decided to return the all-metal case to give the device its desired strength. FiiO also decided to strengthen its bass, making the A1 a better version of the A series. To many who know about FiiO’s products, this is an improvement of the previous A1 amplifier for class D acoustics. Besides the features, its main advantage is that it is available at an affordable price. Well, here are some of the basic features of this model. To begin, it is FiiO’s tradition to package its products in transparent plastics. This model is no exception. Except for the AMP, the box contains a charging cable, 3.5mm connectors, spare clip and a plastic bezel without clips. So to say, its delivery is pretty good for the price. 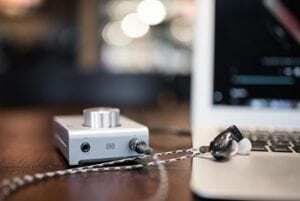 FiiO A1 Headphone Amp’s design is simple. Apart from the compact aluminum case, the lower and upper sides are plastic. It has an audio input and micro-USB socket for charging on the sides. Working with the device is also simple, with two buttons for volume adjustments next to the LED control button. When fully charged, the amp can work for 12 hours. Unfortunately, there is no auto-power down function that can switch the amp off automatically. Therefore, if you forget to switch off the amp, its battery can discharge. If you are looking for a headphone amp with great and intriguing features, consider the Creative Sound Blaster E5 Headphone Amp. From the high-quality sound, analog-digital converter to an external sound card, this device has it all. This high resolution and overly portable headphone amp is built with precision for audiophile components. It is the best in the class of 600-ohm amplifier and aptX technology that supports Bluetooth and perfect audio component for music aficionados, whether they are listening from PC, smartphones or tablets. The Creative Sound Blaster E5 Headphone Amp is designed to produce high-fidelity sound quality/audio that minimizes noise and distortion. Its impressive cirrus logic digital to analog converter with an impressive 120dB supports sample rates of up to 24-bit resolution. Being a modern headphone amp, this device allows music lovers to stream music wirelessly via Bluetooth. Its updated version, Bluetooth 4.1 allows for a one-touch and fuss-free Bluetooth pairing. It has a wide range of Bluetooth codecs including AAC, SBC and aptX low latency, all which enhance audio quality wirelessly. This device comes with 3200mAh battery that offers up to 8hours of continues music playback, even when using Bluetooth connectivity. With the USB port, android users of the Creative Sound Blaster E5 Headphone Amp can charge their smartphones while using. The actual battery life of this device varies with usage, environmental settings, and settings. When it comes to entertainment, finding the best device is of utmost importance. Interestingly, finding the best headphone amp out in the market can be quite daunting. This is due to the endless models available and various features to consider. Well, below are the three top things to consider before buying headphone amps. Many times, people are excited about buying a headphone amp that they forget if they need one. You should note that headphone amps are not an add-on accessory but rather a resolution that drives your headphones to full potential. Low-impedance headphones – if your headphone impedance rating is less than 80 ohms, you don’t need one. In-ear headphones – on-ear headphones work well with headphone amps. However, don’t get an amp if you have in-ear headphones. This is because in-ear headphones have small drivers that don’t need external amplification. Active noise canceling headphone – there are high-end headphone models that have active noise canceling ability. If you have such, do not purchase headphone amp as they are already embedded with one. Where Do You Intend to Use the Amp? If you are always on the move, consider getting extremely compact, lightweight and portable headphone amp. You can use it when clipped in your pocket or the shirt. On the other hand, if you need an amp for use with your smartphone and PC, consider headphone amps that come with DAC. This means that you will connect the device through a USB cable and listen to music by connecting your favorite headphone to the amp. The budget should be an important consideration when making your decision. Though our list contains amps under $100, it features amps of different price tags, ranging from $20 – $90. Besides, a higher price doesn’t guarantee better sound quality. It just means better quality build and extra features. Reduce distortion – average build headphones are plagued with noise distortion. This is why you should invest in headphone amps to reduce external distortion. 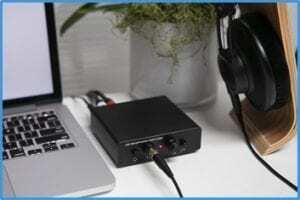 Enhanced sound augmentation – if your headphones don’t deliver quality audio or the sound quality is not that much detailed, you will benefit from a headphone amplifier. Its magically transforms the audio quality of poorly formatted audio. It also enhances bass and track’s details. Wide impedance range – most headphones under $100 support a wide range of impedance. Note that impedance determines the type of headphones the amp can drive. The wider the range, the better. Pint-sized – most of the products mentioned above are compact and highly portable. They can be wound on your phone or clipped to clothes. They are certainly accommodative. With such benefits, you would be missing out a lot if you don’t have a headphone amp for your average quality headphone. These devices come with diverse features that make them a must-buy item, especially for audiophiles. Nonetheless, before settling for one, ensure that you consider the amp’s features. Find an item that is compatible with your headphones, compact and portable and of course, affordable. This will help you find a device that enhances your music listening experience, but not worsens your audio quality. That said, from our list above, which is your favorite headphone amp? Share with us in the comments section below!